Meanwhile lets just say that we are proud llbine@yahoo.com contributed a whooping 243 entries. Hal Williams & Pete Joseph finally arrived home after being almost 1 week AWOL. They had an even tougher time getting home than had Gil Bishop and Bob Treadwell. They got to Cairo alright, but it was just about then that things clamped down and one had to have tickets and priorities, etc. to make the grade. Well, just being on leave they didn’t have much of a chance and then, too, the weather wasn’t too wonderful and they had a tough time getting out and on their way back here. They landed at a spot considerably farther west than Sicily, in Africa, and had to wend their way back this way again. 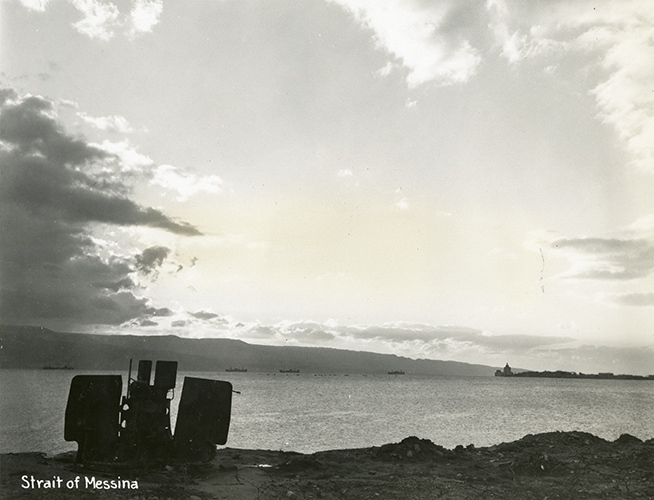 Finally, they did land in Italy and at last on the Island, but on the other side of the Island. From there they took the train back. Hal said that he’s sticking to the ground from now on. The train ride was apparently very good, very comfortable and relatively fast. George Davis left a few days ago, but probably will return again in another month or so, as his job will keep him traveling. I might go up and visit him on my leave – I know not. We now have a new roommate — Capt David Waugh. Chaplain Daib traded places with him, as Waugh was living upstairs and he has a bum knee that supposedly hurts him too much to keep walking upstairs. Bret Smart, however, says that’s hooey — for Bret wanted him to do even more exercising than he had been doing — but no, instead, Waugh wanted to move down. Daib agreed to move up, but without consulting us. For now we are all mad at him (not because Waugh moved in, for he is O.K.) but because now we have no one to wake us up in the morning. It is bad — our two rooms — one with Blaisdel, Johnson and Stola, and Jack and I, had a hard enough time getting up in the A.M., even with the Padre there to prod us until we had to get out of bed, but now with him gone, we are in a sorry state. As a consequence, we are going to picket his Sunday services and Stola is going to be our preacher. This morning’s picketing the Padre wants us to keep up — he had 15 new members in his congregation today — he likes this picketing idea!! But truly, we are sorry he moved upstairs, for he was loads of fun to have in the room at all times. Yesterday we heard a most interesting talk on Typhus, given by one of the men who has done most of the work over in this region, Africa and Italy. We met and knew him when first in Africa and he did a lot of his work at the so-called “Pest House,” which we visited there. 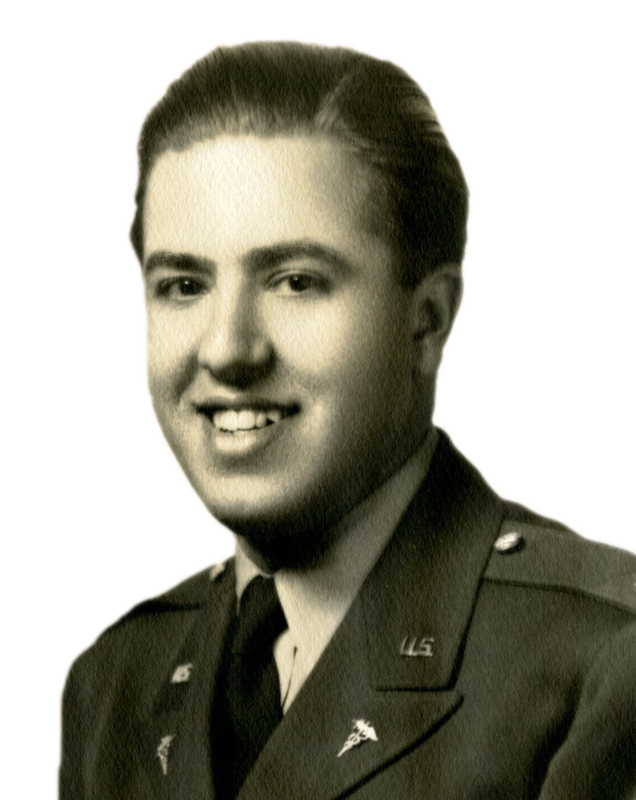 The high points of his talk were: (1) The typhus vaccine is definitely effective – there have only been something like 5 or 6 cases in American soldiers and these have been very mild without rash in 50% of them. (2) There is no specific therapy at all – only good supportive care with adequate fluids, good nursing care, etc. Sulfa and Penicillin are not effective. (3)We now have an effective de-louser and de-mosquitoer. There are now plans a-foot for a celebration on April 6th – tho’ I think it is actually going to be on the 8th – our second Anniversary of the Unit. 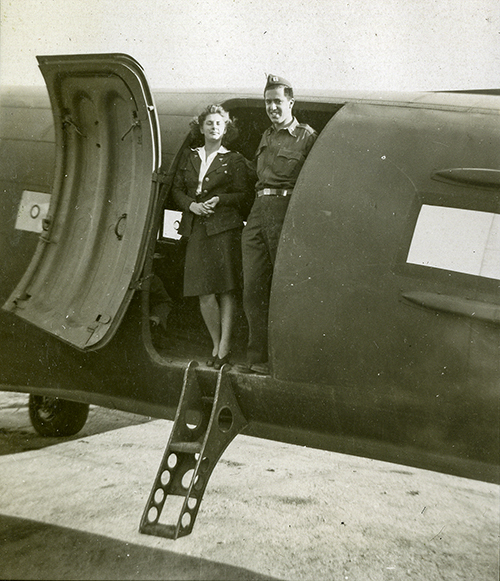 René tells his parents that Hal Williams (pictured in the middle) and Pete Joseph (pictured far left) finally arrived home after being AWOL for almost a week — trying to get “home” from leave in Cairo. 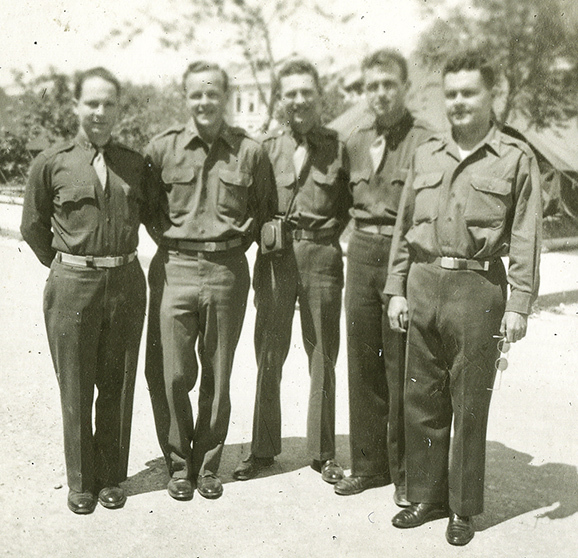 Also in the photo are Paul Stratte (second from the left), Bill Newsom (second from the right) and Bill Kuzell (far right). On St. Patrick’s Day night I was roped into a bridge game by Collie. Usually those games are rather dull – Collie is good, but the Col. not so hot at bridge, particularly the bidding. Well, the other night turned out to be a very interesting one. The bridge was pretty good, but the person who was the fourth at the table made the whole evening really entertaining and interesting. She was one of the Red Cross workers in town and is in charge of distributing clothing to refugees and civilians, among other things. Her name is Mrs. Margaret Kumler. She’s a woman in her early fifties and gray haired. Every few minutes she was mentioning some other town or different part of the U.S. in which she had been, so that it didn’t seem as if she hit the same town twice in conversation the whole evening. I don’t know just where she is from, but she studied at Bryn Mawr and her husband had a big department store in Dayton Ohio. She has six kids, all married. She lived in Seattle quite a while, also in San Francisco and has a house down at Del Monte. Her husband is apparently dead. She has travelled extensively, particularly around this part of the world – having spent the last 18 years around here on and off – spending most of the time on board ships. René tells his parents that he was roped into a bridge game by William Collie (shown second from the left in the photo above of a previous card game). 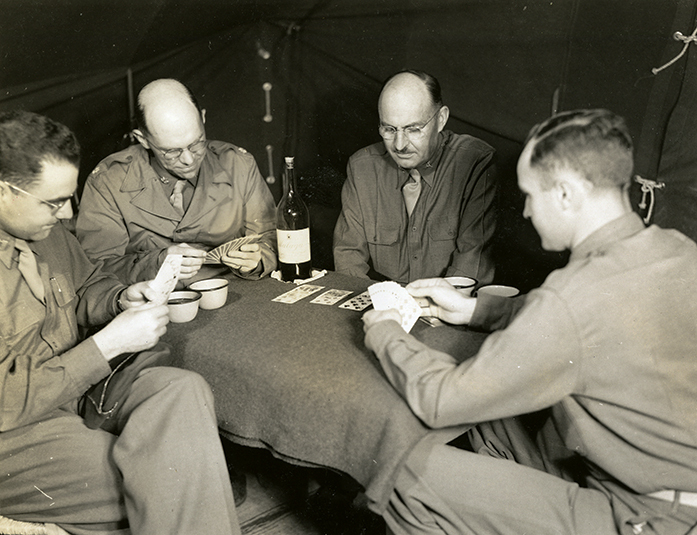 The game also included the Colonel (shown above second from the right) and a Red Cross worker named Mrs. Margaret Kumler. Yes, my dear, I agree, women are strange creatures! The whole thing was a complete surprise to me, and that, I guess is what made it worse for me. I hadn’t had the slightest inkling of what was coming, until that 21st of December. The whole thing is pretty unexplainable, apparently even for Lois. As she says, “I can’t accurately analyze when or how or why it happened — it just did — and that is about all I know for sure.” Probably the best explanation is that she wasn’t really ready to settle down to sticking to one person alone, particularly in this kind of a set-up where everything is sort of abnormal at best. What I mean is, those who go out with various fellows get to see and do a lot more than those who only go with one, particularly if that one is in our unit where our transportation situation is such that it is practically impossible to get around. All this, undoubtedly, was a factor. That’s about all I’m able to tell you for that’s all I know, myself. I’m sorry I can’t tell you more so that, as you say, you “will understand better,” but it’s impossible for me to explain to you something that I don’t understand either. I’m afraid it will take some higher power than you or I to do the explaining. No, she didn’t “meet someone else,” that is, at least not before she told me of her decision. It so happened, however, that the pilot who had flown us around the island some months before, Rudy Engle, had been a patient here at the hospital at the time Lois broke up, and she started going out with him a great deal. The whole thing was such a complete reversal that it was incomprehensible. I had thought at first that she just wanted a “fling” but she herself said that she was going to go out with different people. But then she began to “specialize” with Rudy and suddenly thought she was for the “first time in love” with him. Actually, I’m sure she just doesn’t know her own mind one way or the other. I keep hearing from and writing to her, so at least maybe there is some hope. And to answer a question several Dear Folksies readers have posed: Yes, René and Lois were married (back when they were in Virginia), but they had to tell the Army that they were just “engaged” or they would have been separated into different units. So, because their correspondence was subject to Army censorship, they had to use the word “engagement” instead of “marriage” when they wrote home. Yesterday I took a walk with Jack as ‘twas a beautiful day – wandered down around the water and though it was warm enough, the water did not look very inviting. The boys have been petitioning me to take another trip around the island with them, so I believe I will do so at the end of the week — just after pay-day. There’s no use taking a bunch of broke soldiers anywhere! René took a walk with Jack Dunlap on a beautiful day in Sicily. 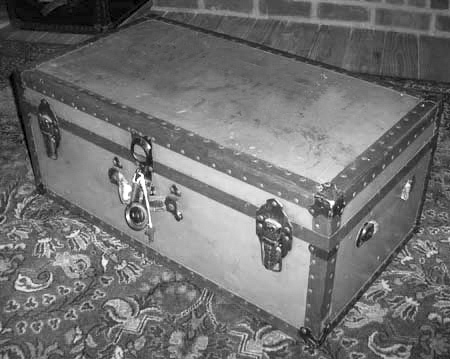 I intended to write long ago to warn you of the arrival of my “foot-locker”. I think I told you way back in July that we were no longer allowed to pack them around with us and as a consequence some sold theirs and others of us just stored them with the idea that we possibly might be able to use them later. Then, we later were informed that we could ship them home, so we ordered this done – sort of by remote control. You see, I left my locker in June, ‘twas stored with everyone elses by George and then sometime in November, here, we were given the papers to sign so that they could be shipped. So, while it wasn’t sent until November, I had been widely separated from it since June. A little surprised that they charged so much. Of course, that was extra luggage and not considered as necessary, so, therefore the charge. However, had I realized that it would be that much, I probably would have tried to sell it rather than have it sent. It’s almost time for supper, nothing new – will write after I return from the trip. Last November, René sent his footlocker home -filled with things he didn’t have room for anymore – but forgot to tell his parents to expect it. Well, here it is our Second Anniversary – just two years since the 59th was activated!! Day after tomorrow there is to be the big celebration. The recently appointed Majors are giving a cocktail party late this afternoon, however. The reason the big party is to be on Saturday is because Saturday is naturally a better day for such things and also ‘tis a better day for those who intend to join us to do so if they can. That is, George Wood and Phil Johnson, who planned to fly here as to be in on the celebration. I got the package you sent, Mom, with all the deviled ham and pate, for which oodles and oodles of thanks. Thank Sal also for me, as I noted that some of the cans had her name on them. Looks like there is enough deviled ham to last through several minor feasts. Now to tell you some about the recent trip around the Island that I took with a second bunch of enlisted men. This time I had only 3 of the same bunch that I took the first time: crazy Eddie Accomando, the mess sgt; Sgt. 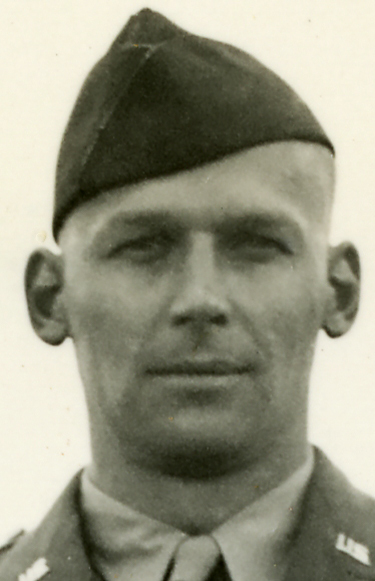 Jones of Receiving; Sgt. Sparks of the Dispensary. 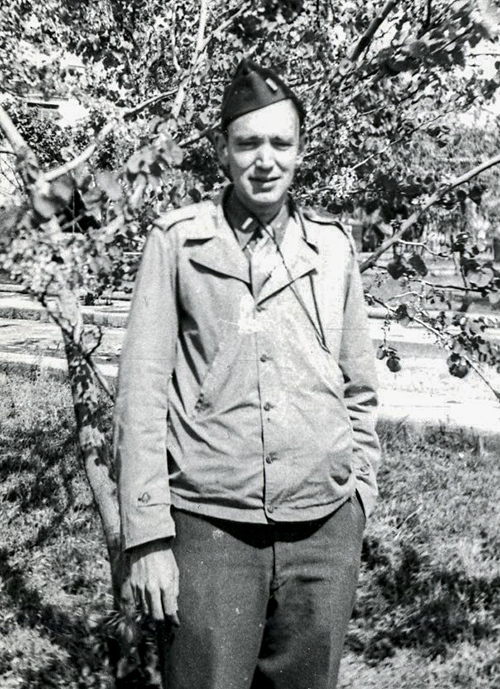 The other fellows were S/Sgt John Fedorchak; T/S Howerston from Surgery; T/4 Glenn Farrell, T/4 Merrin Spainhower (“Spainy”) both from surgery also; T/5 Al Coleman, T/5 Carl Santelle (“Red”) from surgical wards; T/5 Ray Johnson from lab; T/5 Tom Voicheski who runs Isolation, Bill Arduino, Bill Murdock and Ross Willis; and “Dutch” as driver. It was a good bunch and all got alone fine together. In many respects it was a better bunch to be with than the first bunch, though on the other hand, you can’t beat fellows like Querhammer, Maidens, Wy and Weisty that were with me on the first one. Left here after eating midnight mess and, of course, everybody but the driver tried to sleep. I was plenty tired and tried to curl up in the front seat of the truck, but the truck we had was smaller in front than most of them, and as a consequence it was rather crowded for sleeping purposes. I dozed a bit and that was about all. 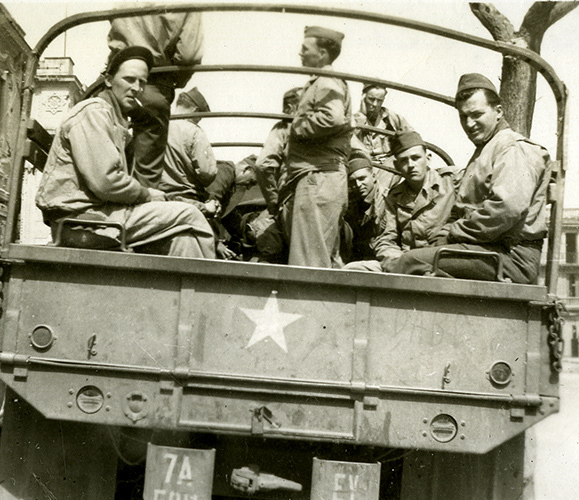 The boys in the back got car-sick strangely enough – probably because the top was over the whole truck and the weather was rather nice, so that it was warm in back. And then, too, the road was dusty and the dust kept getting sucked into the back of the truck, so that when we stopped for gas I was shocked to see that the boys had their faces completely covered with a dark brown dust. They really looked funny. We made pretty good time and got to the small town [Taormina] at which we were going to stay shortly after breakfast time (tho’ we hadn’t had breakfast, of course). The town now has a rest camp (a hotel) run by the air-corps. On the first trip, we had discovered this town, but had only stayed a few hours there. Ever since then, all the trips have gone there and stayed, as it is a good place for the men to spend their three days. Rank doesn’t count there – it’s a rest from everything – no saluting, uniform regulations are minimal, etc. Anyway, when we arrived, we found that the Air-corps hotel was full, so we moved into another hotel that the other trips have been using most of the time. It was a pretty nice place – really just apartments – clean, and with a nice view of the town, the mountains, and the water and even Italy. 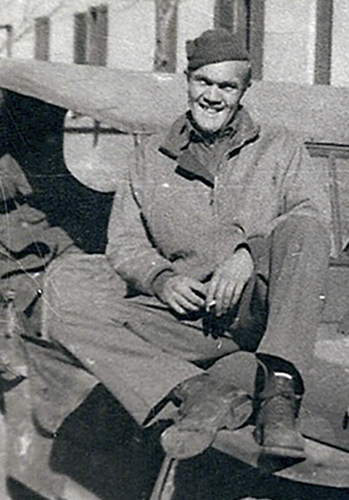 Walt Morduant and Stan Jobe were just leaving the place, as they had spent part of their 7-day leave up there. We went in and got settled and proceeded to have breakfast. We brought along our own rations and the people at the hotel fix them up for our meals and buy anything else that we want to eat. As a consequence, we managed to have 4 or 6 eggs apiece for each breakfast and had some pretty good meals. Among other things, we had some good fresh boiled vegetables (cauliflower, broccoli, etc.) and French fried potatoes. Also, one night we had some very good lobster. 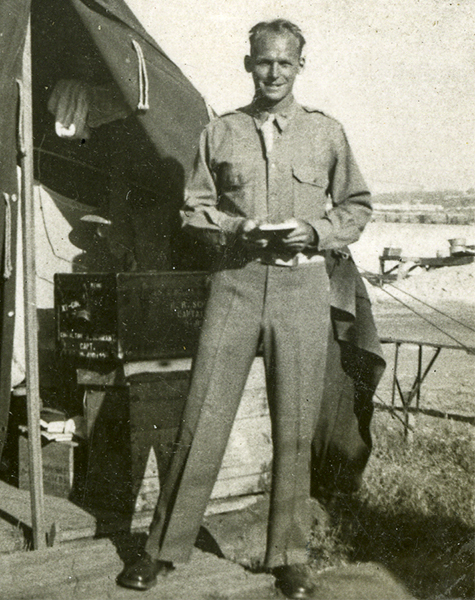 We had brought our own bread, butter, bacon, canned fruit, macaroni, fruit juices, coffee, tea and some C-ration. So, you see, we ate well – in fact, very, very well. 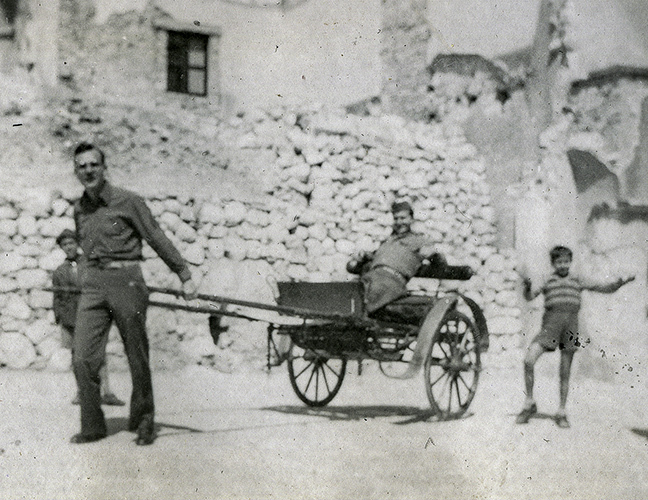 John “Dutch” Boven was the designated driver on this trip to the eastern shore of Sicily. 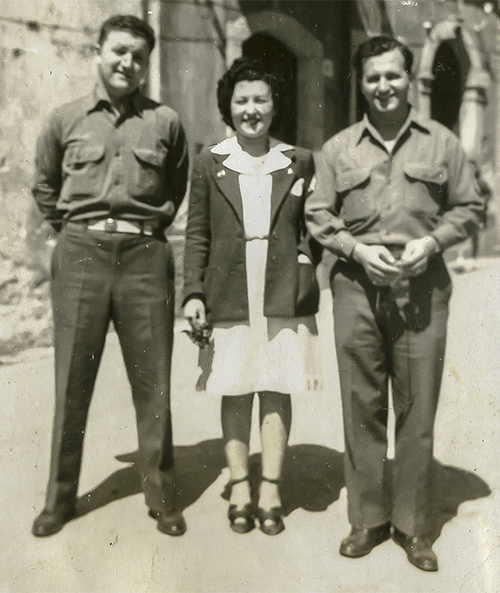 In Taormino: John Fedorchak (left) and Eddie Accomando (right) with Eddie’s “gal-friend” in the middle. In Taormino: Bob Jones pulling Eddie Accomando.